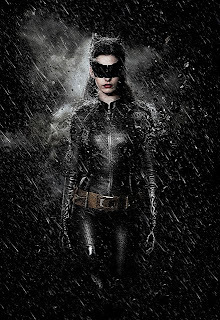 Out Of The Batcave: My favourite Dark Knight Rises image so far. My favourite Dark Knight Rises image so far. So, the cinema i work in has started to fill up with variant quads, one-sheets, rather lame standee's and lovely 8 foot banners. Best image so far is one fo those banners and is thsi - don't she look great? Love the pose, the outfit material, the fact the mask has no eyes, and the barely discernable cat ears. Terrific stuff.